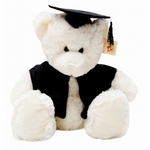 Sarah Graduation Bear 14cm | Graduation Bears and Gifts at discount prices! This little girl is a light caramel colour and wears a black satin graduation cap with black tassel and a black satin graduation cape. In her cute little paw she clutches her well earned graduation certificate.